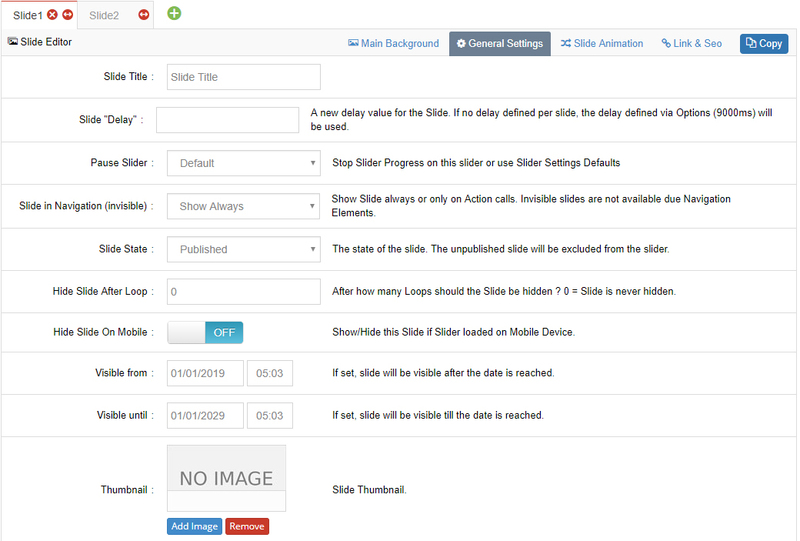 Override the Default Slide Duration for this one individual slide. Choose to pause the slider’s progress when the slide is reached. This option allows for “wildcard” slides, which is essentially a slide that wouldn’t be in the slider’s normal rotation. The state of the slide. The unpublished slide will be excluded from the slider. Choose if the slide should be hidden after a certain amount of loops. For example, the slide could be shown initially, and then once the slider has looped through all the slides, the slide could be hidden on the second time around. Choose if the slide should be hidden on mobile devices. This option could be used to “minify” your sliders on mobile devices (where 5 slides is probably a more effective presentation for mobile than 10, etc.). Normally the slide will always be visible by default. But you can choose specific dates to enable/disable the slide.